When it comes to diagnosing the source of our patients’ foot and ankle issues, there are various processes we might use. In many instances, we can simply examine a foot visually and understand the nature of the problem. Other times, x-rays and other diagnostic imaging devices are useful for providing patients with an accurate diagnosis so we can effectively treat their conditions. 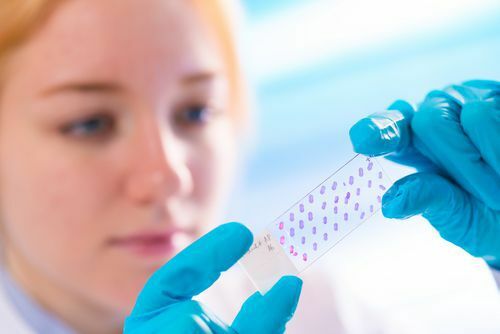 Sometimes, though, our doctors at Austin Foot and Ankle Specialists may need to use a soft tissue biopsy to analyze tissue on a cellular level and identify the cause of problem. This procedure involves the removal and microscopic examination of a small sample of soft tissue for diagnostic purposes. "Soft tissue" includes the skin, fat, muscle, and tendons that surround, connect, or support other tissues or organs. These biopsies require little time or involvement from the patient, yet they enable the foot and ankle surgeon to reach an accurate diagnosis and determine the best treatment for the specific condition. A wide variety of medical conditions can be identified using this method. Some people think the word "biopsy" means that cancer is always suspected, but this is not true. In fact, malignant (cancerous) and premalignant conditions account for only a small percentage of the diagnoses made using these procedures. What Does a Soft Tissue Biopsy Entail? Shave biopsy – A thin piece of tissue is shaved off. Once the sample is obtained, our doctor or staff member will send it to a clinical laboratory so the condition can be properly identified. The specimen will be examined by a pathologist who specializes in evaluating soft tissue biopsies. Patients should carefully follow the instructions provided by our podiatric surgeon to maintain the biopsy site. If the area has stitches, we will schedule an appointment for their removal. It usually takes a couple of days for the lab results to arrive at our Austin, TX office. In the unlikely event you have not heard from us regarding the results after 10 days, be sure to contact us. Biopsy results, as well as treatment that might be required, will then be discussed. At Austin Foot and Ankle Specialists, we are committed to your health and wellbeing. As part of this commitment, it is our goal to accurately diagnose the conditions that are affecting you. By doing so, we can determine the best way to address any issues you may have, and prevent their recurrence. When you want to be treated by Austin’s leading experts and professionals who are committed to constantly redefining what excellence in podiatry means, then give us a call at (512) 328-8900 or schedule your appointment with us online.